If you haven’t used Google Maps before I suggest you take about 15 minutes and start playing. Enter your home address, work address, a place you would like to visit. You will be amazed at the technology and probably a little paranoid too. The detail that can be achieved is truly astounding and from the screen shots below you can see how creative the citizens of planet earth can be when they know Google is watching. All of the images below are real and nothing has been altered or “photoshopped” to create the satellite photos you see. For the non-believers a link to the Google Maps page showing the image has been included so you can zoom in and zoom out to see the surrounding mapped area. 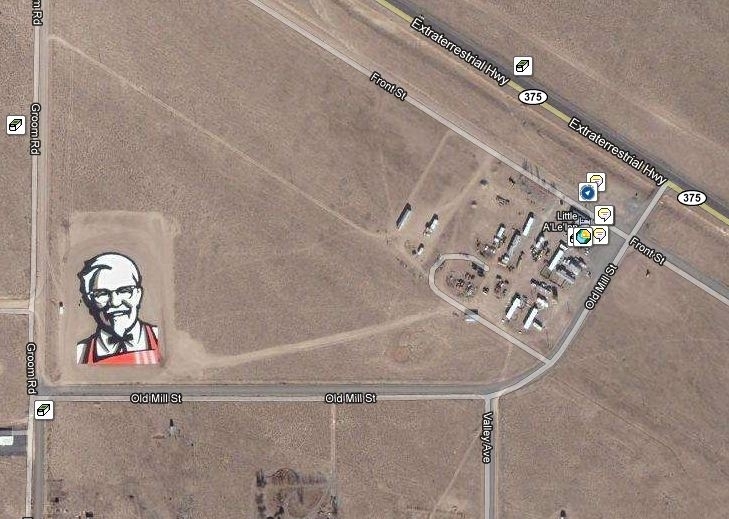 If you know of any other satellite photos that should have been added please make a comment. A clever advertising ploy on a planetary scale. Do you wonder if aliens see this and think this is what we all look like? View the Colonel’s Google Map. A deer runs gracefully…upside down…through a meadow. See the deer in Google Maps. The rough terrain in Alberta, Canada forms the head of a Native American when viewed from Google’s eye in the sky. And is that an ear bud and cord dangling from his ear? Get a better look. “LUECKE” is written in trees, literally. This was done by clearing trees while leaving strategic trees in the shape of the letters. 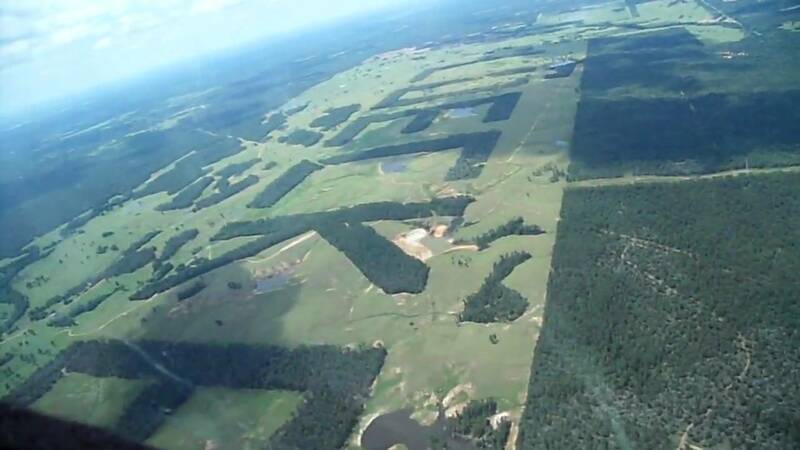 This is actually viewable from space, so go for a closer look (see the size of the trees in relation) at Google Maps. That is one helluva big Easter Bunny! You can find this bunny in Artesina, Italy. Supposedly this rabbit was knitted, not that you can see the yarn at this distance. Is he dead or sleeping, you be the judge. You can also see the rabbit at the artist’s site. 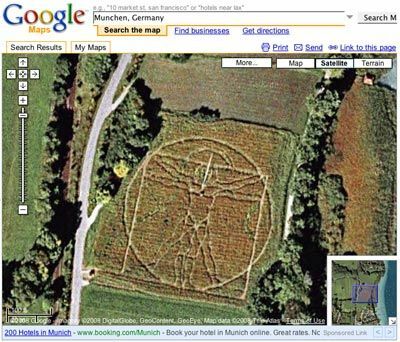 Leonardo da Vinci‘s Vitruvian Man is just as impressive when created in a field. Not sure how long this one will last so see it fast at Google Maps, it will grow on you. 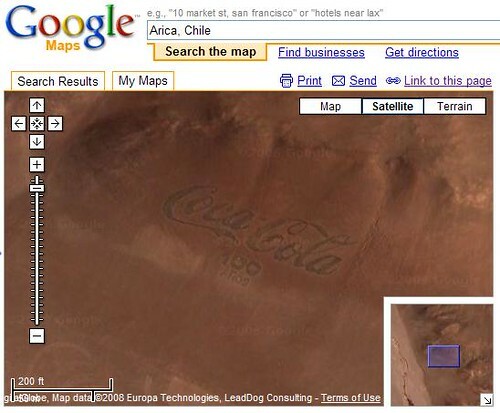 This Coca-Cola logo was supposedly created out of coke bottles just outside of Arica in Chile. I wonder if that is considered littering? See the bottles at Google Maps. That was one titan-sized belly flop that created that lake. See the real belly whopper in Google Maps. I believe you could have a top ten crop circles list if you wanted. Although the Firefox crop circle is cool, I would have rather seen this list without the crop circles. How did they make the Colonel Sanders? Was it painted sand? This list is very funny. 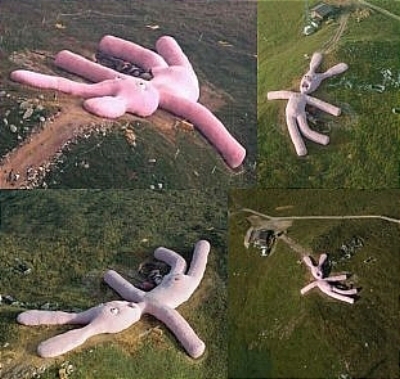 The pink bunny is most definitely dead… his guts are spilling out onto the ground. Maybe I am blind, I don't see anything. Anyone else? 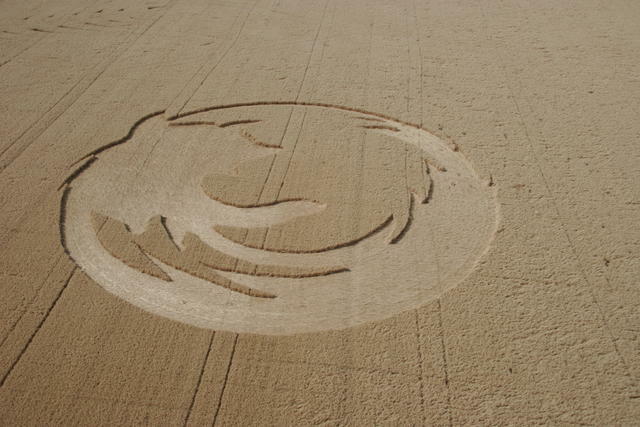 Like the Firefox crop circle – very clever and funny! 1) Do you know what the Colonel Sanders piece is made out of? 2) Any verification that the Coca-Cola art is actually made from bottles? Thanks for these great posts. You provide some very interesting content here!!! I really like the firefox one and what’s great if you look a little down on the other side of the road it looks like a large group of people relaxing in the field. A few cars and a small aircraft make me think their the artists. There is a face of a man just west of the woman’s in the Alberta one…. 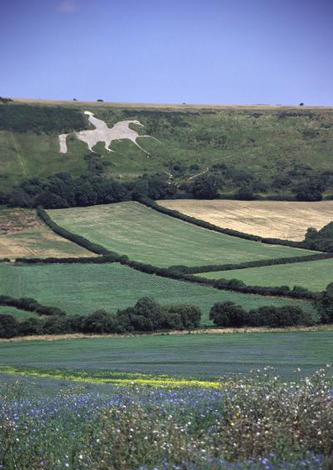 is this just a happening of nature or did someone deliberately create this one?